Beautiful Sugar - really gorgeous! This is gorgeous Pat. I love the image, beautiful colouring and fabulous detailing. Beautiful card for your friend Pat that image is truly wonderful the papers and design are gorgeous, I love it. Sweet card, love the design. Thanks for playing with us at Simply Create Too. Pat: Thanks for joining us at Simply Create Too for our Mother’s Day/Female Challenge. Your birthday card is so pretty--your friend will love it too. Please visit us again this Friday [14 Feb] for our new challenge. Your card is beautiful and elegant Pat, I love the image and pretty papers. Gorgeous card! The image is beautiful as well as your coloring and design. 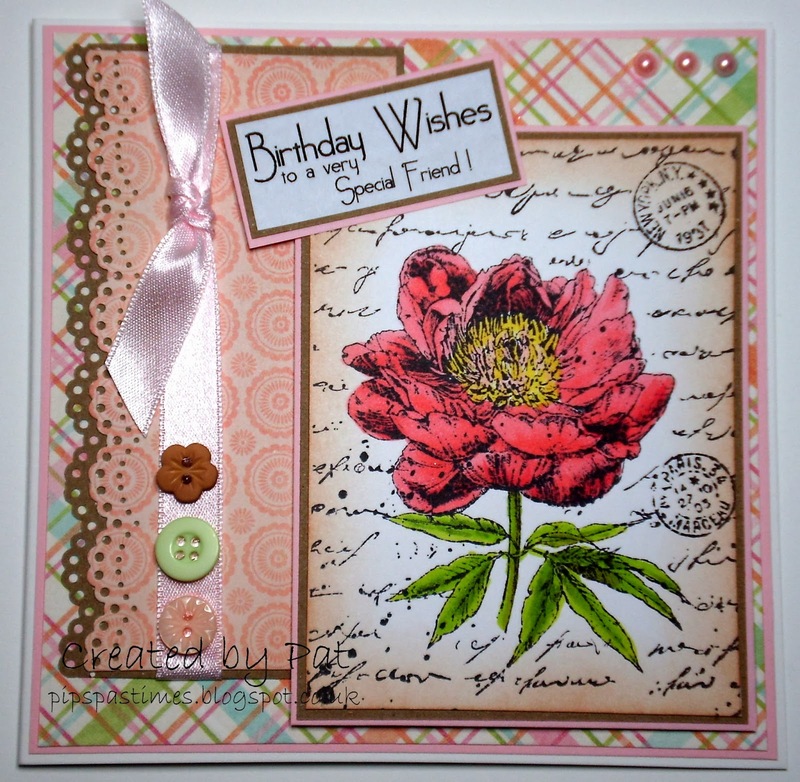 Thanks for joining Inky Impressions Challenge and hope to see more of your creations here. Absolutely gorgeous, the image is beautiful and as always those first edition papers work so well. Your card is gorgeous, it is a fantastic theme. I hope your friend likes the card, no doubt she will. Thank you very much for sharing it with us at Stamp 'n' Doodle. Ooohh this is beautiful!! Love your pretty coloring! Beautiful card. Thanks for joining us at Sassy Studios for the DTBST Stop and Smell the Flowers challenge.